Though Dr. Ricketts began college with the intent of becoming a podiatrist, a back injury changed the course of her life. “No one could help until I started seeing a chiropractor.” She completed her undergraduate education at the University of Tennessee, earning a Bachelor’s Degree in Biology. She worked as an EMT before moving on to Parker University to obtain a Bachelor’s Degree in Anatomy and a Doctor of Chiropractic. During her years there, she worked in the school clinic and saw many senior-aged patients. It prepared her to understand their unique health challenges and concerns. Today, she sees many older patients at Bearden Chiropractic and Acupuncture Clinic, where she has learned a great deal. 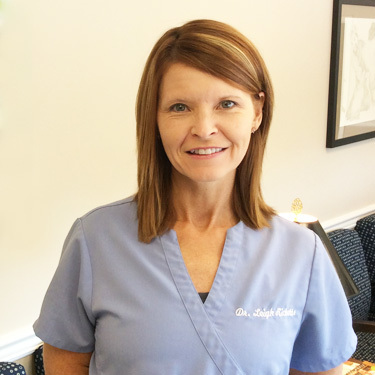 She began working with Dr. Shreve upon her graduation in 2001 and has the ability and confidence to treat a myriad of different conditions outside of the back and neck pains that many associate with chiropractic care. There are many area women who enjoy having Dr. Ricketts as their healthcare practitioner. She spends the time needed to understand each patient’s condition, giving them gentle care and attention including low-force adjustments. I love to come to work and help someone deal with their pain and live a more normal life. One of her patients was a senior who could barely walk and came into the office bent over. After two weeks of intensive care involving noninvasive adjustments and some therapies, she is out of pain and returns to ensure that her problem stays at bay. Dr. Ricketts is originally from Chattanooga. She moved away to attend college but was pleased to return to her home state to practice. Her husband is in the military, and they have 2 wonderful dogs. She leads an active lifestyle and favorite hobby is exercise. She is a member of the Tennessee Chiropractic Association and is a member and officer of the TVCA. Find out more about our natural form of health care! Contact our team today to arrange your first appointment.